Searching for the best flea bombs and foggers? Having a flea infestation means war. Although, there are many ways of getting rid of fleas one strange method involves nuking your home with a flea bomb to kill all fleas. But how effective is this method, more importantly how safe is it? Having your house infested by fleas is a real nuisance. It’s as if, nothing you do is working. From vacuuming regularly to get rid of them or treating your cats and dogs with flea drops, you still might not be successful in getting rid of fleas. However, this is where the best flea fogger comes in. What is a flea fogger? Simply put, a flea fogger is a small aerosol can containing insecticide. 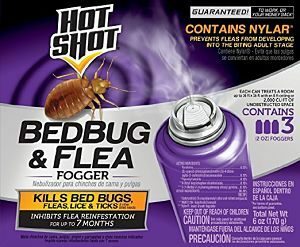 To use a flea fogger, you only need to release the bomb in the room infested with fleas. The working mechanism of the flea fogger is quite simple. The insecticide contained inside the flea bomb is supposed to be sprayed around the house such that the tiny droplets cover all the exposed surfaces. However, since making contact with the chemicals is dangerous, it’s important to choose such a time when everyone from the household is gone including the pets, for several hours. The chemicals present are poisonous and can lead to illness in pets as well as people. Before spraying, it is vital that you check the flea fogger’s label to make sure that your family stays safe and can also stay out of the house for the recommended period mentioned on the flea bomb’s label. Here’s a review of the Top 5 Flea Foggers you should know about if you’re in the market for an effective item to get rid of a flea infestation. Make sure to read about all of the items to find the best flea bomb for your use. This is a dual action fogger, which can be used for killing a number of insects apart from fleas. Not only does it penetrate the crevices and cracks to kill hidden fleas, but it also leaves behind a fresh scent, ensuring your household doesn’t remain uncomfortable for long. It kills annoying insects on contact and provides relief from them for up to 12 weeks. It’s one of the ideal products for use in household storage areas, garages, basements, attics, and apartments. With one can, you can treat up to 2,000 cubic feet. • Kills fleas on contact. • Doesn’t leave behind any residue. • Can kill other insects such as ticks and beg bugs. • Doesn’t provide a long-term solution. 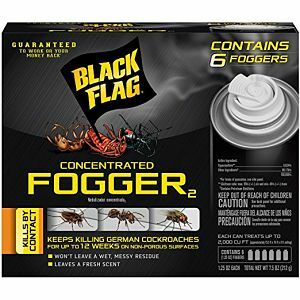 With this best flea fogger, you can get rid of not only fleas but also any lingering ticks and bedbugs. It kills the insects on contact and offers an effective long-term pest control. It can easily reach fleas that tend to hide in open cabinets, floor cracks, pet bedding, upholstery, drapes, rugs, and carpets. It’s unable to kill fleas during their larval stage. So, while effective, it isn’t a permanent solution for flea infestation. The formula of the Hot Shot flea flogger contains Nylar which helps to prevent the fleas from growing into reproducing adults. As a result, it can inhibit the re-infestation of fleas for up to seven months. With one can of this flea fogger, you can treat up to 2,000 cubic feet. • Gets rid of adult insects. • Provides a long-term solution. • Doesn’t kill fleas in the larvae stage; thus it is not a permanent solution. 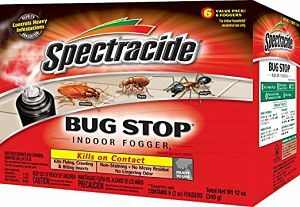 Another effective flea killer is the Spectracide indoor fogger. It creates a fine penetrating mist that can reach into crevices and cracks. Consequently, it kills all the hidden bugs as soon as it makes contact with them. The fogger has a non-staining formula which doesn’t harm the drapes, shades, ceilings, clothing, walls, linens, furniture, upholstery, or carpeting. It can easily kill the crawling insects as well as flying insects. • Apart from being non-staining, it also doesn’t have any lingering odor. • Doesn’t leave any messy residue. • Kills the bugs on contact. • It doesn’t provide a long-term solution. 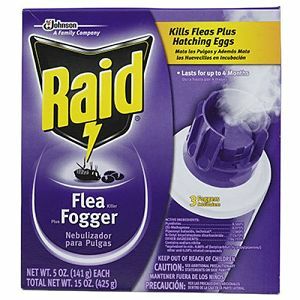 The Raid flea fogger is also another effective solution for getting rid of fleas, owning its place on the best flea bomb list. 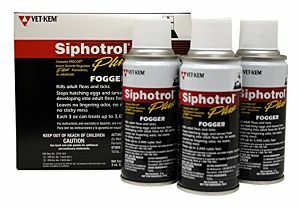 This fogger contains a special egg stopping formula. With this formula, the fleas are killed on contact, and the hatching eggs are stopped from giving rise to new fleas as well. This fogger may leave a residue. So, be careful when using it near drapes and carpets. This fogger contains a growth regulator, and its effects can last for up to 4 months. Furthermore, it doesn’t have a lingering smell. So, your household won’t feel uncomfortable for long. • It’s quite effective for killing fleas and eggs. • Provides relief from fleas for up to 4 months. • Has a formula that stops eggs from hatching. • May leave a residue. The active ingredients in the Precor Plus fogger are permethrin and S-Methoprene. 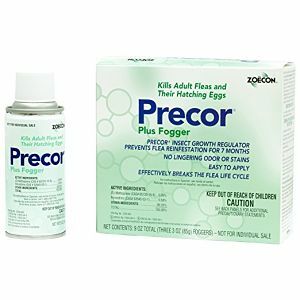 The permethrin kills the adult fleas immediately while the Precor IGS prevents the pre-mature fleas from growing into breeding and biting adults. The fogger penetrates all the way down to places that are hard to reach and usually hide pre-adult fleas. This product can kill fleas hidden in floor cracks, pet bedding, drapes, rugs, carpet, and upholstery fibers. It can prevent the re-infestation of fleas for up to 7 months. One fogger can work for up to 3,000 cubic feet. • Can work for up to 7 months. • Kills adults and fleas that are yet to mature. • It doesn’t get rid of the eggs. Before using a flea fogger! Vacuum your home – The first step is to vacuum the house as this ensures that all the fleas are highly active before treatment. Vacuuming also ensures a higher killing rate. You should also hot wash your pet’s bedding if any, this helps get rid of fleas in your home. Turn off all electrical appliances – Next, turn off the electricity on the distribution board. You can also unplug all the appliances present in your house and turn off the lights and other plugs. Similarly, you also must switch off your air conditioners, thermostats, televisions, and heaters. Air out all closed cabinets – Take note that fleas can take shelter in cupboards. Thus, it can be helpful if you open certain cupboards when you decide to bomb the fleas. However, you must know that if the items in the cupboard make contact with the insecticide, they must be thoroughly washed afterward. First, take a sheet of newspaper and place it in the middle of the infected room on the floor. Then, place one of the flea insecticides can work on it. 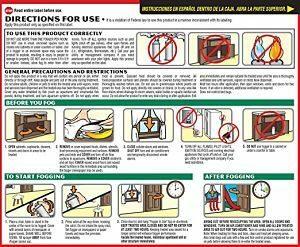 Make sure that you don’t deploy the fogger until you have placed all of them in the other rooms around the house. Shake the Canister – Before starting the fogging process, shake the canister well. 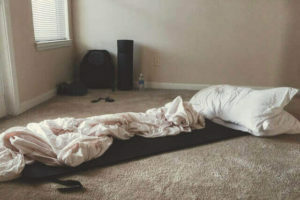 Then, start from the furthest room in the house. Push the top of the flea fogger firmly to start the process. It’s better if you get someone to help you out with this. Calmly exit the area – With help from others, you can deploy the canisters in different rooms together and then exit calmly, closing the door immediately behind you. This way, you get minimum exposure to the chemicals before they start effectively killing the fleas. Once the flea bomb is triggered, the chemicals quickly fill the room, thus, affecting all the living fleas present on the exposed surfaces. The recommended time for letting the chemicals stay in the infected room is 8 hours. It is recommended that you open all the doors and windows and let the place air out. Take note that when using some products, the chemical residue must stay on the carpet or the floor, etc. for a few days since this makes sure that all the fleas are killed. The residue also makes sure that the fleas are killed in their earliest stages like larvae. So, don’t decide to immediately wipe the residue away if the product doesn’t instruct you to. Also, vacuum all the carpets. The purpose of vacuuming this time is to get rid of all the eggs and dead fleas, as well as all the remnants of the infestation. Remember, you can mix a combination of different flea killing methods to increase effectiveness and to make sure that all the fleas including those in the larval stage as well as the eggs are terminated. While flea foggers are highly effective if they are used under the right conditions and circumstances, they can still pose a risk to your family as well as the house if all the safety precautions are not taken. Therefore, before you use a flea fogger, it’s important to note that you keep in mind the safety tips as well as the necessary precautions. There have been accidents involving flea foggers where the consumer used excess fogging material, which in turn lead to the buildup of flammable vapors. Flea foggers are available in a number of different sizes, so you need to carefully read the label to determine the right product for the space you want to get rid of fleas from. 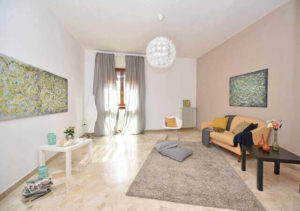 In order to figure out the right amount, you need to determine the volume of the living area. For this, you need to multiply the length, height, and width of each room and then add them all together. Remember, the flea fogger can’t be used in enclosed spaces like under the tables, closets, cabinets, and under the counters. Using the flea fogger in a small, enclosed place is dangerous as it can make the product explode, thus resulting in damage to property or injury to people. There is a high chance of an accident occurring when a large number of fogger chemicals come in direct contact with an ignition source like a pilot light, flame, or a spark from such an electrical appliance that cycles off and on such as an air conditioner or a refrigerator. It’s recommended that you keep the fogger at least six feet away from the ignition sources. Make sure that you warn people that enter your premises to stay away. Apart from telling your neighbors and family members not to enter the area, also use the door tags that come with the product, if any, or print out warning signs yourself. Consequently, this helps to reduce the risk of people walking into the treated and exposing themselves to the harmful chemicals accidentally. When using a flea flogger, it’s important to vacate the treated area immediately. Breathing the mist of the spray might be harmful. To make sure that these foggers are used safely, everyone including the pets must leave the treated space and shut the doors as soon as the foggers are released. Ensure that everyone stays out for the period mentioned on the fogger’s label. If you enter the treated premises before the recommended time period is over, then it can lead to various illnesses and health issues. When you return to the treated area after the recommended time period is over, open all the windows and doors to ventilate all the remaining fumes. You can also place fans in the windows and doors to assist with airing out the treated area. You shouldn’t use more than one fogger for one room. A typical 6-ounce fogger is sufficient for treating a large area; up to 25 feet by 25 feet of unobstructed space. Remember to remove toys as well as all of the uncovered food from the area that needs to be treated. In some cases, there can be a possible backfire as well. The foggers can cause the fleas to retreat further into the house instead of killing them, thus leading to a larger spread. Read the instructions mentioned on the label thoroughly and follow the directions carefully. At all times, keep the fogger away from the reach of children, for example, in a shed or a locked cabinet. What are fleas?How do flea fogger work? Do flea foggers work? Fleas are wingless, small parasites that survive by ingesting the blood (flea bites) of different warm-blooded hosts including humans, dogs, and cats. The biggest they can grow is perhaps the size of the tip of a normal pen, and they range from a light brown color to black. The entire body of a flea is naturally designed in such a manner that it can maximize eating. Surrounding the head of the fleas are sharp spikes while the mouth is designed for piercing through the skin of the host and sucking out blood. Despite their small size, most commonly less than 1/8th of an inch, they make life miserable for the hosts; human, cat, or dog. Since they have hard shells and flat bodies, you need to squeeze the fleas either between two hard surfaces or fingernails in order to kill them. However, even then, where there is one flea, there are surely more to follow. Fleas are equipped with the ability to jump up to 150 times their size. Due to these remarkable jumping skills, fleas can easily transit between the surrounding environment to and from their hosts. Fleas also have the ability of breeding at a very quick rate. Fleas present in cars or on your pet are only around 5-10% of the total fleas possibly present in the environment. The remaining population is present in the form of eggs or larval stages residing in your garden, bedding, furniture, and carpets. Since flea foggers contain dangerous chemicals, it’s important that you follow a few steps to ensure you’re able to safely get rid of the fleas. For using a flea bomb, you need to prepare the house first, and after you are done with that, you need to clean the house as well. While getting your hands on the best flea bomb is the most helpful option for fighting a bad flea infestation, it’s advised that you use it as a last resort. This is because spraying the entire house with harmful chemicals and then cleaning up the aftermath is quite difficult and time-consuming. However, using the best flea fogger combined with the other flea control measures can surely help to terminate these little critters. 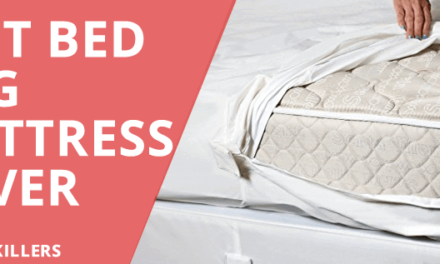 These measures include washing the bedding, vacuuming, and treating your pets. Flea bombs can kill not only adult fleas but also the hatching eggs as well as the larvae, depending on how they function. It can be effective for up to 5000 cubic feet. It’s suitable for an average sized home. Furthermore, it’s effective for almost thirty weeks, continuing to provide protection from ticks and fleas. However, because of the chemicals, it’s recommended that in the case of light infestations, you should use flea sprays since they are safer while being as effective as a flea fogger. Apart from flea bombs, there are a few other kinds of flea killers that can be used for killing fleas. Boric acid is a low toxic inorganic mineral. Despite being inexpensive, it possesses herbicidal, insecticidal, and fungicidal properties. It functions as a flea killer by extracting all the moisture from the body of the insect thus leading to dehydration and eventually death. Even in small amounts, boric acid is highly effective and can also maintain the potency for an extended period. 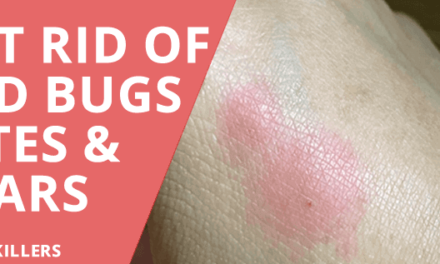 While boric acid can get rid of the larvae of the fleas, it’s not as effective when it comes to killing adult or mature fleas. Unlike flea repellent, Insecticide sprays coupled with IGR products are also commonly used for treating fleas. IGR stands for Insect Growth Regulators, and these are such materials or products that inhibit or interrupt the life cycle of a pest. As a result, the animal fails to reach adulthood, thus failing to reproduce. Inhibiting the maturity of the fleas helps to keep it from reaching the adult stage. Consequently, the life cycle and the infestation are stopped. Another great way to get rid of the fleas is to use flea traps. With these traps, you can get rid of the fleas without having to do a lot. You only need to set up the flea trap and let it sit. It passively kills the fleas while you continue going about your day. If all else fails to work, the last resort is to call professional exterminators that can help get rid of the fleas for once and for all. The best flea bomb alone may not be enough firepower to get rid of fleas. Other flea killing methods combined such as the use of boric acid can offer quite an effective solution. 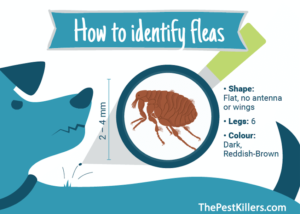 As mentioned earlier, while flea bombs are effective for killing fleas, they should only be used as the last resort because of the harmful chemicals they contain.